Nicaragua puncher Felix Alvarado is a guest @ exciting PBA game between San Miguel Beermen vs North Point Batang Pier live 7 PM on ESPN 5. Cuneta Astrodome, Pasay City, Metro Manila. Elorde MOA Public Media Workout for Randy Petalcorin. Fighters Randy "Razor" Petalcorin and Felix "El Gemelo" Alvardo are guests @ TV sports show ESPN SportsCenter. Official IBF Weigh-in Ceremony @ TV5 Studio 4. Fight Day at Midas Hotel & Casino Along Roxas Blvd. Pasay City, Metro Manila. 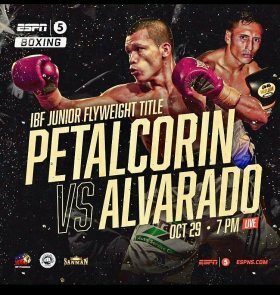 The Randy Petalcorin vs Felix Alvarado fight for the IBF Jr. Flyweight world title Monday October 29 is a production of Gensan award winning promoter Jim Claude Manangquil of SANMAN Promotions in association with MP Promotions and Peter Maniatis Events. ESPN 5 will televise live in the Philippines. For Nicaragua, the fight will be broadcast live on Nicaragua's Canal 4. The author Carlos Costa is a Panama-born veteran man of boxing living permanent in Cebu, Philippines. Carlos can be reached by email: Carlos512@hotmail.com and Whatsapp: +639184538152.